It was a moment that changed everything. David Tomb had journeyed nearly 7,000 miles to see this bird —the holy grail of birding— and when finally face-to-face he discovered a creature that was majestic, leonine, and incredibly vulnerable. 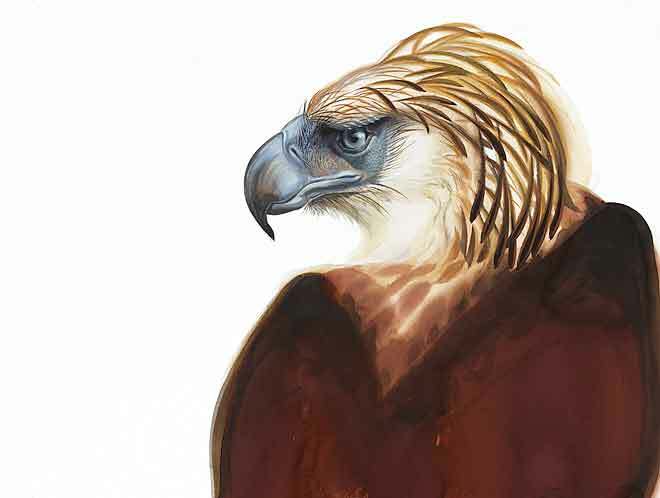 The bird was a great Philippine eagle, a massive raptor with a seven foot wingspan and mane of feathers. An impressive predator, the powerful bird of prey was once called the “Monkey-Eating Eagle,” and today human activity has reduced its numbers to about 200 individuals in the wild. Tomb, an artist who returned to his first love — birds — after twenty years of human portraiture, travelled to the Philippines in 2011. He and a group of birding buddies found themselves moved in an unprecedented way when they encountered the Philippine eagle not in the wild but in a hospital run by the Philippine Eagle Foundation. There, they watched as the majestic animal, recovering from surgery after suffering gunshot wounds and a wing amputation, awakened from anesthesia. Discussing the experience with his travel companions, Tomb decided he wanted to do more than just witness these amazing animals, he wanted to save them. 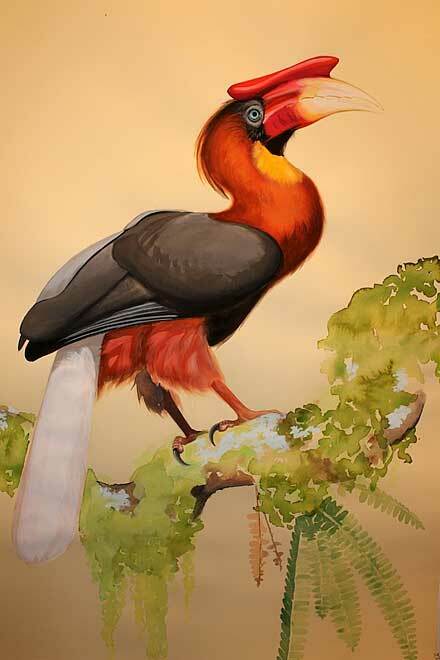 With friends Peter Barto and Howard Flax, Tomb founded the nonprofit Jeepney Projects Worldwide to use art as a way to raise awareness of high-priority conservation birds, their habitats, and support their survival. The group takes a creative approach to their mission. 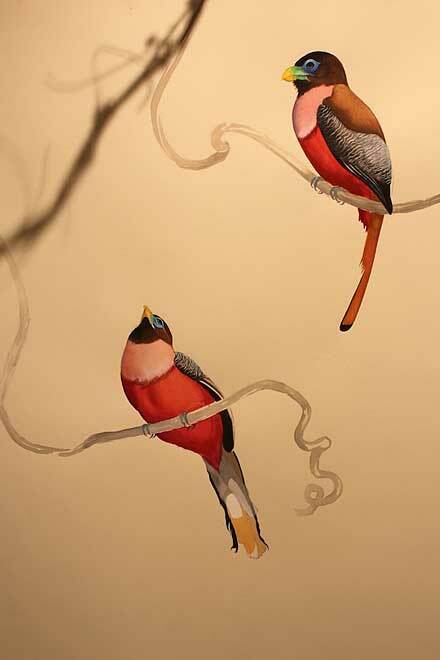 Tomb draws viewers into the experience of seeing birds in their habitat with a multi-sensory gallery experience. Live plants hint at the scent of the outdoors. An interactive soundscape, designed by johnnyrandom’s Flip Baber, follows the viewer through the gallery, immersing the viewer in the eagle’s world with calling macaques, blowing breezes, and bird song. The experience is meant to captivate, raising awareness of a the endangered eagle and importance of saving its habitat. Tomb uses art as an entry point to dicuss the bird’s plight and the work of the center in preserving habitat, rehabilitating birds, and empowering local communities whose poverty puts pressure on the eagle’s habitat. Tomb also sells benefit prints through the website to raise funds for both the Philippine Eagle Foundation and another key bird habitat, El Triunfo Biosphere Reserve in Chiapas, Mexico. So far, Tomb notes, responses have grown with every retelling of the eagle’s story. In the year since the project’s creation, Tomb has created several original prints and already sold twenty. Tomb also hopes that as awareness of the Philippine Eagle grows, more people will learn about sustainability and how the demand for Philippine Mahogany has pushed the bird’s numbers down, causing massive deforestation. Below are two more of Tomb’s paintings, and you can click this link to listen in to a soundscape depicting the eagle’s habitat (hint: you can run it on a separate tab while viewing the paintings here). For those near Berkeley, California, you can see Tomb’s work on display at The Bone Room through February 29, and his work will also be displayed this June at San Francisco’s Electric Works.